ORLANDO, Fla. — Eric Holder delivered his last speech as Attorney General on Monday before the annual International Association of Chiefs of Police Conference in Orlando. He’s stepping down from the job. 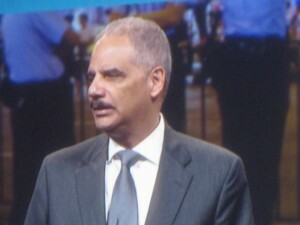 During his speech before thousands of law enforcement folks, Holder mentioned Ferguson, Mo., and the need for police to address the issues of tension and mistrust between the community and the police departments. “As our nation’s Attorney General, I have always been proud – and steadfast – in my support for law enforcement personnel and their families, who make tremendous and often unheralded sacrifices every single day to keep us safe. Holder was touching on a sensitive subject. While cops understand the tensions in the community, they often feel misunderstood, and that the challenges they face in policing are glossed over when it comes to addressing such issues. Holder, who didn’t deliver the speech with a lot of passion, is also seen as a surrogate for President Obama. And frankly, a fair amount of folks in law enforcement aren’t in love with the president. I had a former federal agent tell me that the following day. In fact, a video message from President Obama was played Monday before thousands of law enforcement officers. Obama said he was grateful for the jobs they do and the sacrifices they make. When the video ended, there was polite applause, but it was clear the clapping was not done with a lot of love. It’s an important issue Holder talked about. And addressing that issue can help the community and police departments. Hopefully, some of the cops can appreciate the message and not worry about who delivered it. Posted: 10/28/14 at 12:10 PM under News Story.